This is the combinations of what I had dealt with for five years, using gray color, communication media and dust as the object of ambiguous existence. The exhibition consisted.of four rooms. In the room titled "Flying Woods" , I set up 1000 pieces of airplane models on the floor sprinkled with the dust I had collected at the nuclear power plant Monju in Fukui prefecture. The whole operation of the dust gathering was filmed and shown in the next room. The walls of the third room were covered with photographs of cloudy sky which I had taken all over Japan. On the floor, there was a star shaped object made of the dust I had gathered at another nuclear power plant in lbaraki prefecture. 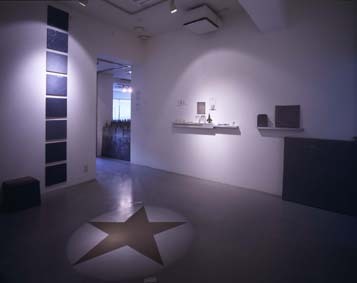 A monochrome video signifying the world of gray was shown in the last room.